The Ngorongoro Conservation Area is a nature reserve which main feature is the Ngorongoro Crater. The crater floor is covered with open grassy plains that hold both fresh and brackish water lakes. It is the world's largest unbroken, unflooded volcanic caldera. The Crater formed when a giant volcano exploded and collapsed on itself some two to three million years ago. Ngorongoro is thought of as "a natural enclosure" for a very wide variety of wildlife. It has the densest known population of lion in the world. The most commonly seen animals are gazelles, zebra and wildebeest. At its inscription special notice was taken of the balance between conservation and the needs of the Maasai pastoralists who still take their livestock into the reserve. Ngoro Ngoro is the sound cow bells make. At least this is one of the possible origins of the name Ngorongoro. These bells you hear right away when descending the 600 meters from the crater rim. Some Maasai herdsmen are leading their herds down for water. These herds consist of dozens if not hundreds of cows. At the crater floor we encounter only birds at first, such as cranes and the sacred ibis. The major salt lake also holds numerous flamingos. Unfortunately you cannot come close, but a pink glow can be seen. Not far away is a mud bath full of hippos. These are more lively than the ones we saw in the Serengeti. They perform a full circle of 360 degrees with their fat bodies, so they get completely covered by the mud. On a plain our driver suddenly spots a rhinoceros. There are only 22 of them in the crater, so it's a rare appearance. He is moving among a group of wildebeest and buffaloes. With this (black) rhino, we have completed seeing the "Big Five" of predators in two days (lion, elephant, buffalo, leopard, rhinoceros). Another highlight comes from a family of hyena just along the road. We first see a male and a pregnant female hurrying in front of our jeep. A little further it shows that they were on their way to their little ones, which are half hidden in a pit. There are three kids in all. The whole family then huddles together nicely in the pit which is full of mud. A few meters away a large warthog is buried in the same way. After lunch we drive through a part of the 260 square kilometres large crater which seems to hold fewer animals. On the crater wall there are huge herds of wildebeest, just like ants when seen from a distance. Also, there are zebras, as they are everywhere. In a corner of the crater floor is a spot with higher grass and trees. Here we see lions again. Six of them stretched out in the grass. And then four females with two children. The latter are close to the road and look at the visitors in the jeeps. Their mothers, however, all look the other way: they have their eyes on two zebras. One lioness slowly creeps through the high grass. Two others remain on the lookout. The fourth has started a large move to the zebras from the other side to surprise them. We continue to look for a long time, but it doesn't come to an attack. Lions need to be very close to their prey to be successful, they then jump on top of it by surprise. This is one of the most special places that I visited in all the world. Simply magic and unique. Highly recommended to everybody and, of course, to those loving wildlife. I recently visited Tanzania on safari for my honeymoon. We visited in early July and spent almost two weeks there. On our travels we visited the Ngorongoro Conservation Area. It was amazing. Although we were there during the dry season and everything wasn't as lush as in pictures I had seen, it was beautiful. The weather was cool to cold along the rim, but inside the crater it was perfect weather for safari. Because of it being the dry season the tsetse flies were minimal and mosquitos were not a problem. We saw lions, hyenas, black-backed and common jackals, elephants, DeFassa's waterbuck, vervet monkeys, baboons, plenty of hippos, wildebeast, zebra, Thomson and Grant gazelle, flamingo, three species of eagles, various water birds, buffalo, and four black rhino. Amazing!! A lifetime experience for naturalists. A nice note is that the crater closes at 6 pm daily and this is strictly enforced. Park rangers watch your every move from above. The needs of the animals are definitely the priority here. Returned to Canada from a great tour. Enjoyed our time at the crater very much. 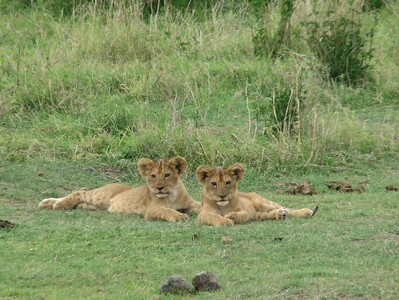 Had excellent guides/drivers with Leopard Tours, stayed at Serena Lodges and enjoyed them all very much. The Serenena Lodge at the Crater being one of my favourite. Food excellent, staff wonderful. Room very comfortable, enjoyed the cooler evening for sleeping. Saw an amazing rainbow late afternoon over the crater out my door - great photo. Saw lions, rhino, huge elephant lots of other animals also. Would have liked to see more rhino, but at least saw the one. Great day, would like to explore area surrounding crater more - next time! Enjoyed seeing the Maasai with their herds, missed them when we got to the Serengeti. Was not overly impressed with Olduvi Gorge, but it was OK.
Big Five: The 1992 IUCN list of mammals in the AB evaluation includes all 5 (of which buffalo, elephant and leopard were present "on the crater rim" 9but (but still within the inscribed area) whilst Rhino and Lion were "in the crater". As of 2009 it is thought that all are still present, with the Rhino the most threatened. Critically endangered fauna species: Black Rhinoceros - General: "Population size collapsed during the last century, from an estimated 65,000 animals in 1970 to a mere 2,300 in the 1990s. Rhino numbers are now increasing, but recovery is slow"; in Nogorongoro: "between 11-14 in 1995"
Early Hominid Remains: Based on fossil evidence found at the Olduvai Gorge, it is known that various hominid species have occupied the area for 3 million years. Leakey Family: Olduvai in the Ngorongoro conservation area was also famously "discovered" by Mary and Richard. Early Pleistocene: Olduvai Gorge gave its name to "Oldowan". This "is the archaeological term used to refer to the stone tool industry that was used by Hominines during the Lower Paleolithic period. The Oldowan is significant for being the earliest stone tool industry in prehistory, being used from 2.6 million years ago up until 1.7 million years ago" (Wiki) Later remains have also been found at Olduvai. 122 Community Members have visited.